TL;DR: Throughout this article, you'll be using Django, Django REST framework, and Vue.js to develop an application with a REST API back-end and a Vue.js front-end. The API will be consumed by the Vue.js front-end with the help of Axios (the HTTP client library) and JWT authentication will be handled by Auth0. You are going to start by installing all the project's requirements, then you will bootstrap Django and Vue.js as sub-projects. You can find the final source code of the demo project that you will create in this GitHub repository. Python is a general-purpose programming language and it's among the most popular programming languages in the world nowadays. It's readable, efficient, and easy to learn. Python is also a portable language available for major operating systems such as Linux, Windows, and Mac. For web developers, Python has many great tools and frameworks that make developers more productive and able to build prototypes in no time. The most popular web framework for development in the Python landscape is Django. Django is advertised as the framework for perfectionists with tight deadlines because of its ability to allow developers to quickly build prototypes. Django uses the power of Python that offers Django developers a great set of features such as class-based views and a powerful ORM that you can use to model your database requirements without writing any single line of SQL. The Django ORM abstracts away all the complexities of working with databases and, most importantly, doesn't intimidate you when your client has not decided yet on the database system to use. You can start developing using an SQLite database (which doesn't need any special installation) then you can switch to the right database system later on when your client has settled on the right RDBMS (Relational Database Management System) to use. Django also comes with a powerful migration system that allows you to migrate your database safely and without losing your data when you make changes to the database structure later on. Another advantage of using the Django web framework is that it has a big and an evolving community. This community has created open source packages for common web development problems, so you don't need to reinvent the wheel when building your project. Django has an excellent and complete documentation of all the features of the framework supplemented by a set of tutorials created by the community. Django is also suitable for beginners and you don't have to be an expert in every feature of the framework to start building your web application. "Django is also suitable for beginners and you don't have to be an expert in every feature of the framework to start building your web application." Before you can create the back-end project, you need to install some requirements on your development machine. For Django, you need to have Python 3, PIP, and venv installed. Please note that you don't need to install a full-fledged database management system to develop with Django. You can use an SQLite database which allows you to have a file-based database that doesn't require any special installation. Let's start with Python 3. Chances are that you already have Python 3 installed on your machine. If not, then the process is simple. You just need to head over to the official downloads page and pick the installer for your operating system. The venv module (part of the Python 3 standard library) allows you to create lightweight virtual environments for your projects. This allows you to have an isolated environments for each Python project (i.e. dependencies are isolated for each project and from the system-wide packages). Setting up an isolated environment provides you with more control over the installed Python packages. You can have different versions of the same package without having to worry about any conflicts, which allows you to work with different Python projects with different package versions. Also, since each environment can have its own Python binary, this allows you to create various environments with different Python versions. Once you create a virtual environment, venv will take care of installing the latest Python binary. Next, you need to install pip, a package manager for Python that, by default, installs packages from the Python Package Index (PyPI). You should have pip installed if you have installed Python using the official python.org installer (or via Homebrew in MAC). Also, if you are inside a venv environment, pip is already installed. For Linux, you may need to install it separately. If that's your environment, take a look at this guide and this page. Vue.js has a CLI utility that allows developers to quickly generate SPAs. The CLI offers pre-configured build setups for a modern frontend workflow and takes only a few minutes to scaffold a basic project boilerplate. This boilerplate is shipped with features such as hot-reloading, lint-on-save, and production-ready builds. Before you can install the Vue.js CLI, you need to have a development environment with Node.js 6.x or newer and NPM version 3 or newer. You can install both of them by heading to the official Node.js website and download the right installer for your operating system. For development machines, it's recommended to use NVM. You may need to add sudo to the NPM command to install commands globally depending on your NPM configuration. After that, you should be able to visit the Vue.js application in your browser by navigating to http://127.0.0.1:8080. JWTs are composed of three parts: a header, a payload, and a signature. The header contains information such as the algorithm used while signing the payload and the header (e.g RS256) and the payload holds the claims. To learn more about JWTs, take a look at this reference. Before you can use Auth0 authentication with your application, you first need to create an Auth0 account. If you haven't so yet, sign up for a free account now. As part of the sign up process, you'll be asked to create a Auth0 domain. For example django-vue-js.auth0.com. If you'd like to read more about this, you can checkout our learn the basics documentation, that has some great info on Auth0 domains and how to use them. After that, head over to the API section of the Auth0 dashboard and click on the CREATE API button. 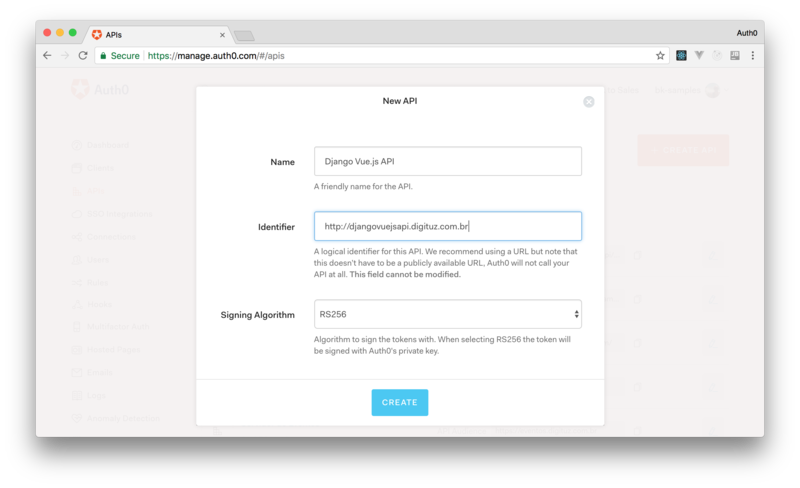 You'll be presented with a form to fill in your API details: the name, the identifier, and the signing algorithm. After that, click on the Create button. You'll be taken to a page where you can further customize your API settings. 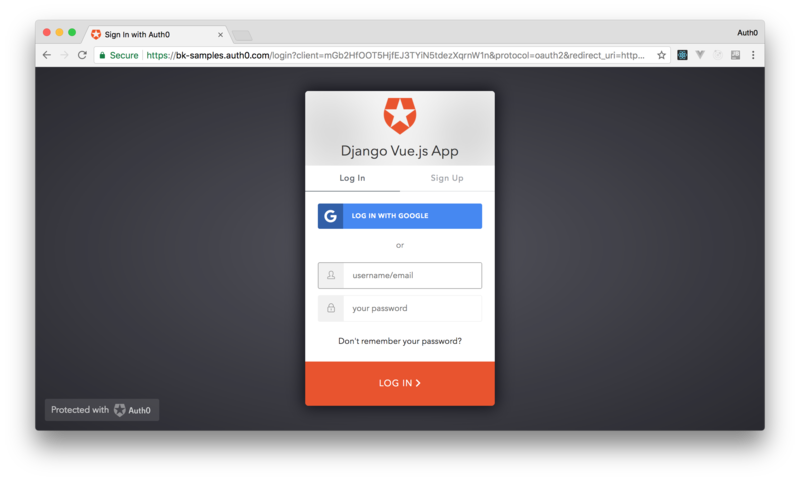 In this section, you will see how to secure the Django REST API with Auth0. In the next part, you will build the API, but before that, you will add JWT authentication to your back-end using Auth0. For this reason, you will need to install the Django REST framework. You will also need to install the djangorestframework-jwt package for handling JWT authentication. You will set up djangorestframework-jwt to use Auth0 for signing the JWT tokens. You may need to install python3-dev if you get problems while installing the cryptography package. Make sure to replace <YOUR_AUTH0_DOMAIN> with your own Auth0 domain and <YOUR_API_IDENTIFIER> with the identifier used while creating the Auth0 API. The public key is retrieved from https://YOUR_AUTH0_DOMAIN/.well-known/jwks.json using the request.urlopen() method. This key is then assigned to PUBLIC_KEY in JWT_AUTH (the settings object for djangorestframework-jwt). JWT_ISSUER is your Auth0 domain name prefixed by https. JWT_ALGORITHM needs to be set to RS256. That means that you also need to make sure your Auth0 API is using RS256. The JWT_AUTH_HEADER_PREFIX is set to Bearer. This is the default prefix used by most frameworks (djangorestframework-jwt uses a JWT prefix by default). You also have set JWT_PAYLOAD_GET_USERNAME_HANDLER to a custom method. This tells djangorestframework-jwt to use your custom method in order to map the username from the access_token payload to the Django user. For most cases, you don't need to store users in your database since Auth0 handles all of that for you including advanced features such as profiles. You can use a custom function that checks if a general (can be fake) user that you create exists and map it to all Auth0 users. For more information about migrations, see the official docs. Please, note that you can return the username of any existing user in the database because you are not going to use this for anything besides the sole purpose of letting djangorestframework-jwt successfully authenticate the user. If you rerun your Django project now (python manage.py runserver), you will have access only to the http://127.0.0.1:8000/api/public/ URL. The other one (/api/private/) will need an access token to be accessed. You can add this configuration as the last item in the settings.py file. To represent your Vue.js front-end application on Auth0, you will need to create an Auth0 client. To do that, go to your Auth0 dashboard and click on the New Client button. You will be presented with a page where you can enter the name of the client and the type of the client. You can fill the name of the application as Django Vue.js App and choose the Single Page Web Applications type. After filling this form, click on the Create button. This will redirect you to a page where you can find the Settings tab. You will need to whitelist the callback URL for your app (http://localhost:8080/) in the Allowed Callback URLs field of your new Auth0 client. This can be done in the Settings tab. In this tab, find the field mentioned and add http://localhost:8080/ to it. Then click on the Save button. You will need to replace <YOUR_AUTH0_DOMAIN>, <YOUR_CLIENT_ID>, <YOUR_CALLBACK_URL>, and <YOUR_AUDIENCE> with the values from your client and API settings. The audience property refers to the identifier of your Auth0 API (i.e. if you followed the instructions, it will be http://djangovuejs.digituz.com.br). This imports the AuthService from ./auth/AuthService and the axios library. After that, it declares the API_URL constant which holds the URL of the back-end server. In this code, you are listening for the authChange event emitted by AuthService when the authentication state changes. You then assign the result to the authenticated variable. You also set the message variable to be empty. This variable will hold the response from your protected endpoint. The login(), handleAuthentication(), and logout() methods are simply wrappers for the corresponding methods in AuthService. In the private() method, you are now using the axios.get() method to send a GET request to http://localhost:8000/api/private/. Since this endpoint is protected by Auth0, you also added an Authorization header. The access token is retrieved from the local storage using AuthService.getAuthToken() method. 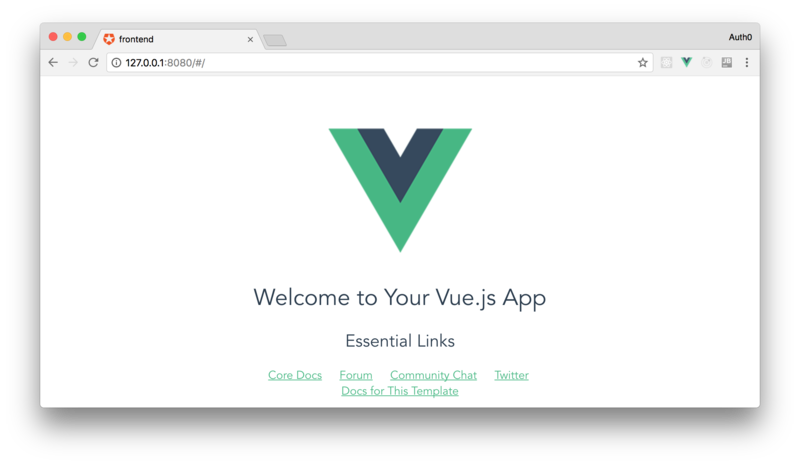 After running both the back-end and the front-end projects, you can head to the Vue.js homepage (http://localhost:8080/) to test it. In the homepage, you will see the Log In button. Clicking on it will redirect you to the Auth0 login page. After authenticating, you will be redirected to your Vue.js application, where the Call Private and the Log Out buttons will appear. Clicking on the Call Private button will issue a GET request to the Django framework, alongside with an access token, and will fetch the secured message. "I just learned how easy it is to integrate Django and Vue.js"
In this article, you have bootstrapped both the Django back-end project and the Vue.js front-end application. You have also added JWT authentication to your back-end using Auth0. If you are interested on learning more about how to create REST APIs using Django REST framework and then how to consume it from the Vue.js front-end using Axios, leave a message on the comments so we can know how popular the topic is.